Those are the words of Joseph Einhorn of thingd, the company behind the new site Fancy. Fancy is a visual cataloging service similar to Tumblr, FFFFound and Pinterest. The idea is to let users curate collections of things they like and tag and add these items to feed into a giant database. 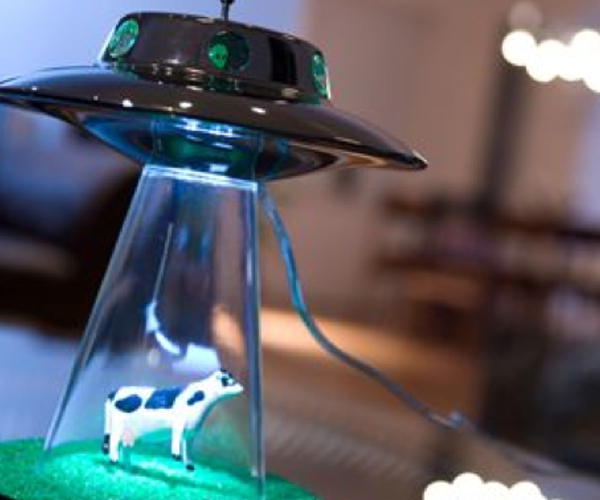 The site is a collection of fashion, photography, graphic design images, furniture and quirky items like this Alien Abduction Lamp by Lasse Klein. For now you have to be invited to Fancy and unfortunately registration is a bit more manual as Fancy hasn’t incorporated a Facebook login yet. Fortunately for you guys we’ve got a few invites to give away. To get hold of one, visit this URL and request an invite, your wish will be granted almost immediately. Adding things to your Fancy collection is fortunately a breeeze. Drag the button below to your browser’s bookmarks bar. When you’re visiting any website and see something you like, just click and pick an image. What makes The Fancy different from other image bookmarking sites? Unlike Pinterest or Tumblr, users are encouraged to tag parts of images, which are then added to the overall database. Users can also easily embed items onto external websites. In this photo you will see that the user has tagged several parts of the image. All of those tags are tied back to Fancy’s database. The site is working on connecting ‘thing pages’ to a location where users can find or buy that item. They are also working on adding a social aspect to the site so you can either add or follow friends’ and members’ things. Unfortunately searching for items on Fancy is about as annoying to do as it is on Tumblr. They are still developing the site, but right now I think it’s a nifty start. One more site to remind us of how beautiful the things we make are. Stay tuned: thingd is working on a few “major improvements to make Fancy really interesting” in the next few weeks along with a mobile app. Read next: Is this proof that the Verizon iPhone 4 is in fact coming in January?